(It's 6:35 in the morning and though I'm exhausted, I couldn't sleep, so here I am posting pictures.) 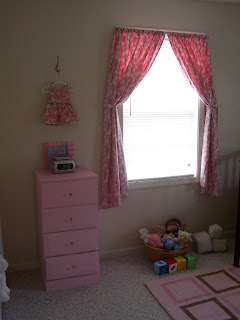 The nursery is really the only room in the house that is done - we worked really hard when we moved in to get it together for Cadie. You can see that she has a lot of toys - I tried to corral them all in the basket on the floor, but the blocks didn't fit. We're really pleased with the pink and brown color scheme. 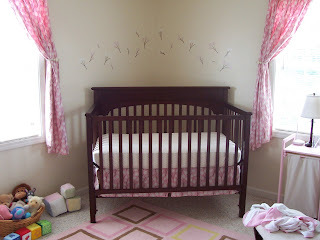 A good deal of the decor came from the Dwell Studio line at Target, like the decals on the wall above the crib, as well as the crib bedding and curtains. We love the glider for feeding and storytime. The rug is from Target too. 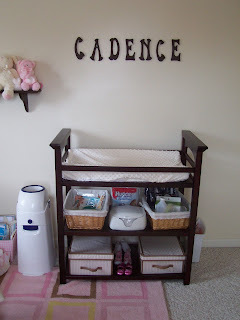 The changing table looks cluttered, but it's very functional. She has such a beautiful nursary. 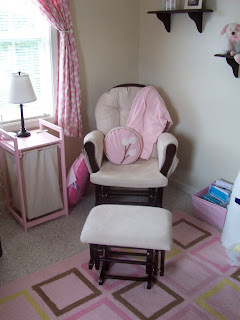 I just loved it the first time I saw it and I can honestly say it is the prettiest baby room I have EVER seen. I was so pleased, you did a great job. I can't wait to see Cadie again and her room. Cadence has such a beautiful room. I love the color combination of pink and brown.